Martin Luther King, Jr. Day is a federal holiday that honors one of the most important and influential people in both the Civil Rights Movement and American history as a whole. So naturally, it makes sense to spend the entire day shutting down intersections, popping wheelies and running red lights on your motorcycle. Oh wait, no. No it doesn’t. 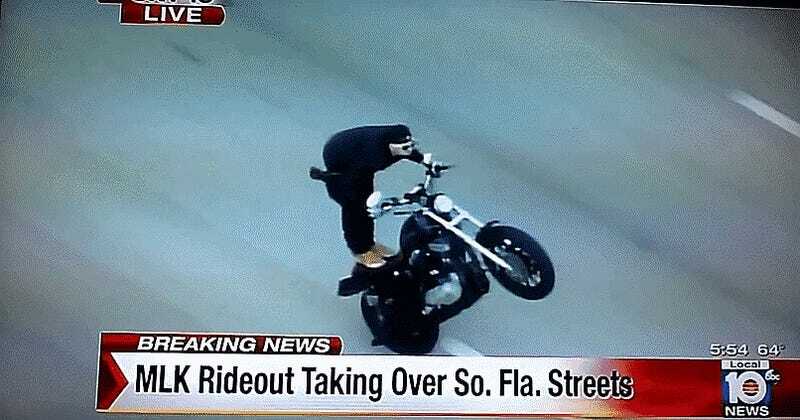 NBC Miami reports that hundreds of riders were caught on video wreaking havoc on bikes and trikes for the Florida (of course) “MLK Rideout.” At least two people were arrested and numerous bikes were seized as the event wreaked havoc on local traffic. The TV news reports the event was themed “Guns down, wheels up” to supposedly honor Dr. King. “You might say good message, bad execution,” the anchor said. I will say there is, however, a special joy that comes from seeing guys on a Can Am Spyder or in a Polaris Slingshot trying to wild out, only to find they can’t run lights because they can’t fit between cars. We tried really hard to find all of the things you could or should do with a slingshot, and that definitely wasn’t one of them.